When I wrote Part I of "When Cash is Trash" just three months ago — colleagues, investors, even friends and family told me I was nuts. "How can you go wrong with keeping most of your money safe in cash?" they asked. "Safe?" I replied. "Give me a break!" Cash is like any other investment — its value goes up and down relative to other assets. Back then I said the current environment made cash just about the worst investment to hold on to. And, today, I still believe that. Mind you, cash is not just the greenbacks you keep in your wallet or purse. It's also the money you invest in money-market accounts, or even short-term treasury bills and notes. 119.97 ounces of gold; today it will buy you only 102.56 ounces. In other words, your cash buys you 14.52% less gold today than it did just three months ago. 1,037.66 barrels of oil; today it will buy you just 981.93 barrels. Your cash has lost 5.37% when it comes to the price of oil. 12,694.38 bushels of wheat; today you can scoop up only 9,319.66 bushels for the same $100k. That's a loss of 26.58% in just three months! The same can be said for the value of the dollar when compared to virtually every natural resource on the planet. Your $100k buys you nearly 30% less corn ... 29% less sugar and coffee ... almost 30% less cocoa ... and nearly 33% less platinum! 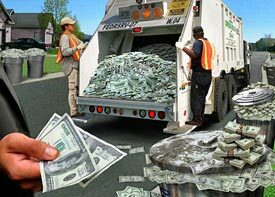 Washington is dead set on turning your cash into trash! Your cash is losing value against almost every currency on the planet, too! Your dollars will buy you less Swiss francs ... less euros ... less Japanese yen ... less Aussie dollars ... less Canadian dollars ... less British pounds ... even less Thai baht or Polish zloty. If you traveled to any one of those countries with your $100k, exchanged it into the local currency and then purchased goods ... anything from an ice cream cone to a night at a decent hotel — you'd get far less than you did just three months ago. As much as 33% less! Currently, I only count three markets where your dollars will buy more than they did just three months ago: Stocks, corporate and municipal bonds, and U.S. real estate. In Four Years, Each of Your Dollars Will Be Worth Two Measly Quarters and One Lousy Dime! Sure, there will be occasional rallies in the value of the dollar. As a matter of fact, we may soon see one that lasts a few months. But even so, there's still absolutely no doubt in my mind whatsoever that the U.S. dollar will lose another 40% of its value in the next four years. How can I be so certain? How can I project another 40% decline in the value of the greenback? Where did I come up with the four-year time frame? First , I figure the dollar needs to fall another 40% to balance out the huge trade and current account deficits this country has with the rest of the world, especially China. If you're watching the dollar index, that means the DXY would have to fall as much as 30%, from its current level of 73 ... to as low as 51. That's not going to happen overnight, mind you. Nor is the dollar going to go straight down. Along the way you're going to see other countries, like the Eurozone, complain like the dickens about the weak dollar ... and how a strong euro is killing their economy. So they will probably intervene in the currency markets to try and prop up the dollar, and stem the rise in the euro. But it won't change a thing. A currency intervention will only result in bigger and wilder swings in the currency markets. And in the end, the dollar will lose another 40% of its value. Second , you won't see a major bottom in the dollar until sometime in 2012. Chief reason: Currencies historically have some of the longest, most durable trends of any market. My long-term studies of currency markets show that up to 90% of bear markets tend to last about 12 years. So a 12-year bear market for the dollar means it won't bottom until 2012. Period! As I said earlier, there are bound to be rallies in the dollar. But in my opinion, they won't amount to much more than bear market bounces. Four years from now, that $100k, which would have bought you 119.97 ounces of gold three months ago ... and 102.56 ounces today ... will probably only buy you 45.45 ounces of the yellow metal, as gold's price skyrockets toward an eventual peak of about $2,200 an ounce. Your cash will have lost fully 61% of its purchasing power. The price of almost everything you buy will have gone through the roof. And it doesn't matter one iota that the U.S. economy is slowing. That certainly won't make for a stronger dollar. In fact, it will have the opposite effect. As the dollar plummets and the U.S. economy stagnates, the resulting inflation will wipe out your paycheck in real terms, confiscating even more of your money. It's already starting to happen! In January, personal income in the U.S. rose 0.3%. But inflation eroded 100% of it; meaning real incomes gained nothing in January. Couple that with the pathetically low savings rate in this country, and you can see why I am so worried about the current — and future — state of affairs in the U.S. So What Should You Do When Cash Is Trash? The simple answer, as I told you in November is this: Don't keep all your money in cash! In my opinion, the only cash you should keep on hand is roughly six months worth of living expenses. #1. Select foreign currencies , which are rising in value against the dollar, and where you can also get a nice return. Two of my favorites are still the New Zealand and Australian dollars. #2. Select foreign stock markets , especially those that are rich in natural resources and where billions of new consumers are driving their economies upward. Examples: China, India, and most of Southeast Asia. #3. Select natural resources and the companies that control in-demand commodities ... the very same commodities that are also rising in value as the dollar plunges. The list includes gold ... oil ... gas ... iron ... steel ... aluminum ... zinc ... nickel ... uranium ... wheat ... corn ... soybeans ... sugar ... coffee ... even water! Want a sense of how much money can be made in natural resources? Consider the recent performance of the recommendations from my Real Wealth Report ! All told, including losers and bonus positions, Real Wealth Report's open and closed positions have resulted in gains of more than $103,000 — in just the last four years! Not bad, eh? So I implore you: Don't keep holding cash when there are so many other great alternatives out there! P.S. If you truly want to protect and grow your money, take out a subscription to my Real Wealth Report . At just $99 a year, it's a screaming bargain. Heck, the gains already generated have amounted to the equivalent of more than $25,000 per year! That's 252 times the cost of the annual subscription! Join now. It will be the smartest investment decision you ever made!